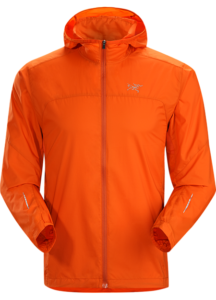 The Arc’Teryx Incendo Hoodie is a great lightweight option for running, and trail runners, that will help keep the wind from biting through and won’t take up space or weight in your pack or back. 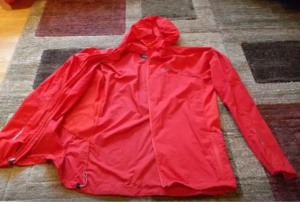 However, if you are expecting heavy rains you may want to go with a jacket that has a more water proof shell – when they say this is water “resistant”, they mean it! It’s not waterproof. Like all gear and trail running items, be sure you understand where you will be using it and what conditions you might need to be prepared for. This jacket did a great job as a backup option in the Rockies and I’ve used it throughout the Northeast. 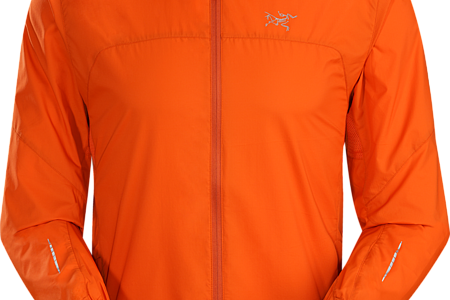 On a few occasions I wanted something heavier when the weather got really nasty – but this jacket should NOT be your go to for a waterproof safety option in case you are injured or delayed in the mountains! So – what makes me keep this jacket in my lineup? I really like the light weight and the design. It’s well made and the sleeve cut along with the side pocket and drawstring help separate it from the rest of the jackets out there. Not only does it have a few nice options like the side pocket, but I also prefer the hooded version. While it may bother some people to have it flopping around when not in use, it’s so light weight that I rarely notice it and I certainly appreciate it when I use it to block the wind or a light rain. Extremely lightweight running jacket with side pocket, cut sleeves, and drawstring. Not for complete weather protection.